A picture of St Mark with his quill. It is from an illuminated manuscript of the Renaissance. The Gospel of Mark is a book of the Bible. It is the second book of the New Testament and comes after the Gospel of Matthew even though it may have been written before it. 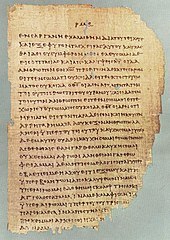 The writer is believed to have been John Mark, a friend of Simon Peter, who was one of the Twelve apostles of Jesus. The four gospels tell the story of the life of Jesus. The word "gospel" means "good news". The Gospel of Mark moves quickly, and the story shows how much Jesus worked during his short 3-year ministry. Mark's gospel tells many things about Jesus which are also found in the Gospel of Matthew and the Gospel of Luke. This page was last changed on 4 June 2018, at 02:47.